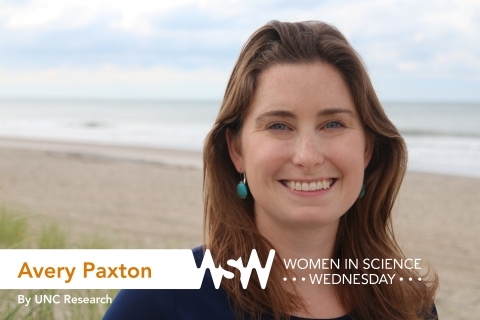 Avery Paxton is a marine ecologist, conservation biologist, and doctoral candidate at the UNC Institute of Marine Sciences. 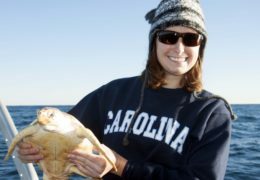 Her research uses a combination of field, laboratory, and analytical methods to address fundamental, mechanistic questions in marine ecology, such as how species use their habitat and how communities are structured. At career day in second grade, I dressed up as a dog breeder! Later, I dreamed of being an archaeologist or a paleontologist. My answer switched again in middle school when I decided I wanted to be a marine biologist. While diving on a shipwreck from World War II, I noticed a bright yellow fire hose strewn across the stern that had been used by other divers to illegally excavate and remove historic artifacts. This disturbed me because the shipwreck was a war grave and a reef for fish. I thought that if shipwrecks were viewed as valuable cultural and living resources, conservation may be more successful. So, as an undergraduate student, I decided to study how fish use shipwrecks for their home. Paxton prepares to release a loggerhead turtle that traveled all the way to the North Carolina coast from Monterey Bay, California. What’s a crazy thing that happened while you were doing research? Seeing an 11-foot great white shark underwater. It was certainly an unexpected and humbling treat to see such a magnificent animal. I consider it a testimony to how the shipwrecks that I study are truly oases for marine life. They form homes for tiny fish all the way up to top predators in the oceans. Do what you love! Find what you’re passionate about and work to turn it into your career. I wake up every day and am excited to get out of bed to go to work. At times, it was a tough road to get here, yet one of the biggest lessons I learned was that you can do anything you set your mind to.